Nothing says "shredded" like well-developed serratus anterior muscles. Those are the finger-like muscles that extend from the back of the ribs to the abdominal muscles. The intercostals -- the small muscles between your ribs -- also contribute to the appearance of a muscular torso. These muscles automatically get worked when you do bench presses, push ups and dips, but a few bonus exercises can help you really zero in for a more chiseled torso. Choose one to three of the following exercises and perform three to five sets of eight to 20 repetitions once or twice a week. Make sure you watch your diet to stay lean enough. Just as with your abs, if you've got too much body fat you'll never see these muscles even though you've worked hard to get them. Exercise specialist Cory Gregory credits dumbbell pullovers for his deep serratus anterior muscles that really stand out. You'll need a bench and one dumbbell to do this exercise. Grab a dumbbell and position yourself so you're perpendicular to the seat. Lay back so your upper back is resting on the pad. Clench your glutes to hold your torso parallel to the floor. Flex your hips slightly and raise the dumbbell above your chest. Grasp it with both hands under the inner plate of the dumbbell. Keep your elbows slightly bent and slowly bring the dumbbell back and beyond your head until your upper arms are inline with your torso. Slowly raise the dumbbell back up over your chest. Read more: How Long Will It Take to Get Ripped? A barbell set up with round plates can stand in for an ab roller if you don't have one. Focus on contracting your serratus muscles as you roll out and in. Begin on your knees with an ab roller on the ground in front of you. Bend down and grasp either side of the roller. Keeping your core and hips contracted, roll out as far as you can without bending or sagging at the hips or back. Use a slow and controlled motion, and keep your elbows slightly bent. Using your core strength, slowly roll back to your starting position. This exercise derives from a yoga pose called Tolasana. It's key for lifting up into yoga arm balances and inversions, but it's an effective way to build definition around your ribs. All you need is your own body weight. Sit on the floor with your legs crossed and your palms pressing into the floor next to your hips. Press through your palms with straight arms to lift your backside away from the floor, keeping only the edges of your feet on the floor for support. Focus on using the serratus anterior to lift you. Press up as high as you can -- this might only be a quarter inch to start -- hold for a second, then lower back down. For an added challenge, try lifting your feet off the floor as well. If you're already doing push-ups as part of your chest workout, just add in this bonus movement to target the serratus anterior. 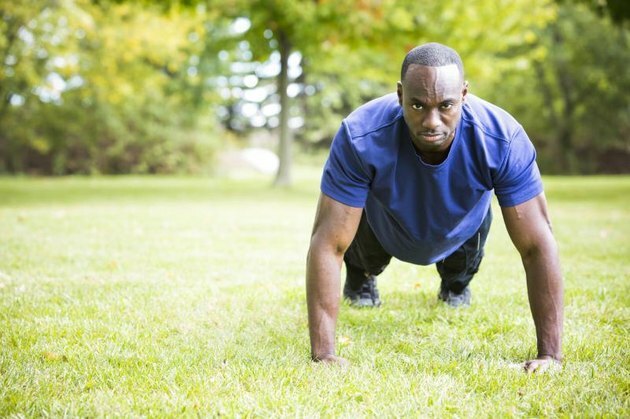 Get into push-up position. Lower down, bending your elbows back and keeping your core locked. Press up to the top of the push-up, then press even higher, rounding slightly across the shoulder blades. 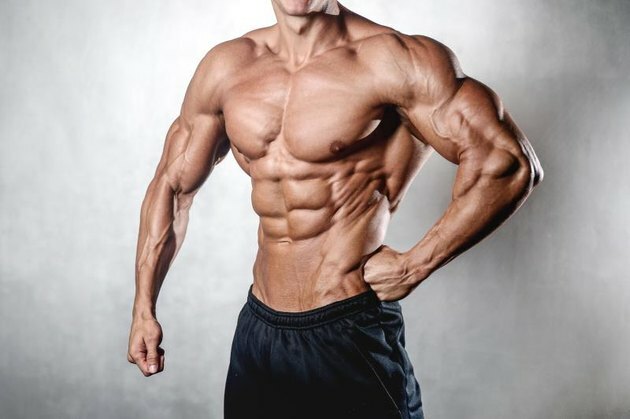 Muscle & Strength: You Have Six Pack Abs, But How About A Serious Serratus? Breaking Muscle: Getting to Know Your Serratus Anterior: Strengthen Your "Wings"